I ride an older litespeed with the old style tapered bb. This one is a perfect replacement without any hassles! A little bit on the expensive side compared to similar products on other places, but Bike Tires Direct was the only place that I found it. Not only are new BB-7700 hard to find, they require more upkeep than a casual rider may want to endure. BB-5500 is a nice replacement for bikes still using Octalink V1 cranks, and the weight and drag are negligible for anyone not racing. Get over your disdain for 105, Tubby. I use 105 bottom brackets for my cyclocross bikes. They are reasonably priced and give good performance at a reasonable weight. 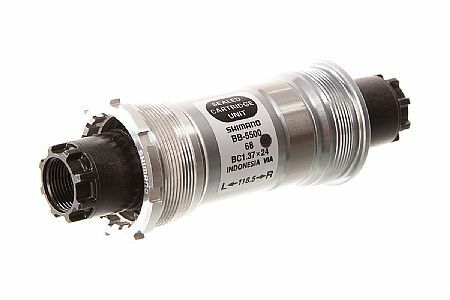 Bottom brackets seldom last 2 years for a cyclocross bike. For this cost I an swap them out before they fail and still get solid performance. Needed this for a older Ultegra Crankset I switched to a Soma Double Cross. Working great so far. Only have a couple hundred miles on it but running smooth. Getting hard to find, but a sturdy part if you need it.